There is, in a certain Faulkner-revering subset of Southern gothic literature, a recurring trope (or signifier, depending on how much Lit Crit you had in college), that of the dead mule. This has come to the attention of various Southern cultural-studies/literature/folklore types--I imagine them as bearded, with a substantial collection of bluegrass CDs and a woodburning stove, possibly in the vicinity of an amiable dog wearing a bandana--and has become something of a literary in-joke, passed around like a Chatham County Line bootleg CD, to the extent that Chapel Hill has a fine drinking establishment of the same name. See, the problem of a dead mule (for those of you who have never pondered it) is not the problem that the mule is dead, although that certainly is a problem, especially for the mule concerned. The big problem is the problem of what to do with it. A dead mule is too heavy to drag away, too stinky to leave there, and too big to bury without a backhoe. There is really only one extraordinarily unpleasant option, which involves reducing the ex-mule to its component parts for easier disposal. In other words, a dead mule means things are going to get gory. Which brings me to my Christmas tree. 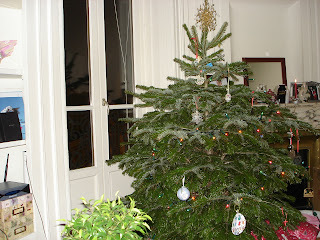 Back in December, we bought a nice, full, six-foot Christmas tree, and I believe I mentioned in passing the adventure we had jamming the thing in the back of a rented Renault. But we got it home just fine, and when we got it out of its bag and set up, it looked great. But January is a cruel month for Christmas trees, and I began to wonder about what to do with the thing once the holidays were over. Back home, I could just chuck an expired tree out in the woods, or at my parents' place at the lake drop it under a pier to provide fish habitat. But here, I have no yard, no woods, no lake...and no car to drive a tree to the dump, as one is expected to do here. Lyon has two dechetteries within city limits, one in the 7th and one in the 9th arrondisement, neither one within two miles of our apartment. That's a long walk carrying a Christmas tree, even if it is just one of the tabletop 3-footers that are preferred here. It's no wonder, then, that the city has passed laws imposing strict fines (up to 750 euros!) for leaving trees in alleyways or on sidewalks. So by Saturday I had begun to despair, with vague notions of either cutting the tree into small bits to throw in the garbage bins--hmmm, I guess I'll have to buy a saw--or dragging the thing onto the metro at a quiet hour of the morning for a one-way trip to the dechetterie. As I was idly cleaning up my stack of mail on the hall table, an item in the 2nd Arrondisement newsletter caught my eye: The city of Lyon has made available several dumpsters for disposal your sapins de Noel. Corner of Rue Suchet and the quai de la Saone. Hey, that's not all that far, lemme check the map for Rue Suchet...OK, that's a long walk, down past Perrache station, but do-able. How late are they open? From 9AM until 4PM, Saturday 6 Janvier ONLY. I check my watch. It's 3PM. We frantically defrock the tree, and I grab my gloves and barn jacket. Obstacle one will be getting the thing down our phone-booth-sized elevator now that it's no longer tightly wrapped in burlap. I briefly consider hurling it down the open center of the stairwell...no. I cram the tree in the elevator by itself, mash the button and race it to the bottom. Except there's a Metro security guy standing right by the turnstile. He doesn't say a word but just shakes his head at me with a look that doesn't need translating: Gimme a break, dude. 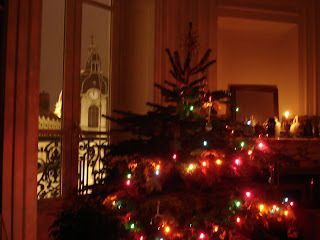 Defeated, I drag the tree back up the steps and out along the quai. There's not much hope of getting all the way down to rue Suchet now, but I keep walking in hopes that they won't drive the dumpsters off at 4 on the dot. Below me, the Saone is running high, lapping over the edge of the low quai where the winos sit in the evenings. There's lots of flotsam and debris in the river. Maybe nobody'd notice if I just gave it the old heave-ho... except it's broad daylight on a Saturday afternoon, and people are already starting to guess what the schmuck carrying a huge Christmas tree along the river is thinking. A car horn honks. Someone yells something at me from a passing Peugeot. I'm starting to sweat pretty hard now. A van pulls up beside me. I turn to look, and it has Ville De Lyon stenciled on the side. "Tiens, mec, where you goin' with that sapin de Noel?" Oh boy, here we go. "Nowhere--I mean, I'm just taking it down to the dumpster on Rue Suchet, on down the quai." "Oh, OK then. So long as you're not just gonna ditch it. We've been picking up trees off of sidewalks all damn day." "Yeah, I heard about that. Big fine and all. That's why I'm taking mine to the dumpster." "That's right." He pauses, looks at the other guy in the van. "Hey, you know what, we're headed that way right now. If you want, just toss your tree in the back and we'll take it for you. Save you a long walk, you know." Thus did my dead mule miraculously disappear, as if a deus-ex-machina flatbed with a chain hoist had happened by on its way to the Purina plant. That was some incroyable luck! So...next year another 6' tree? I'm sure you know that here in Davidson County the "green box" sites limit the size of carcasses you can deposit to a totally inadequate 28 pounds. However we have never had a "dead mule problem" here. The reason that we haven't is that when having a dead mule on hand becomes commonplace, solutions soon become common knowledge. Your basic Davidson County indig will simply take his chainsaw (it's a Poulan, Ed) from his pickup and quickly reduce the carcass to handy 28 pound increments... or thereabouts... and haul it to the dump, separately bagged and twist-tied, of course. It was a lovely tree. A fitting end too. I'm please those folks took pity on you. There's on step toward French empathy for you. Hmmm...so, all I have to do is give Austin a bandana to be a full-fledged Southern cultural-studies/literature/folklore type? Or were you imagining me anyway and just added the bandana thing to throw me off? Haha! Busted! Well, not really-- I was going to add "...a homebrewing setup in the basement and a battered Chevy V8 pickup in the driveway behind the Volvo", but the sentence was getting way too long. But if the Red Wing work boot fits, one should certainly wear it--there is no shame whatsoever in an Oxford American subscription, a PhD, and the Hank Williams Complete Recordings 10-CD box set played on a $3000 stereo. Hey to the missus (and Austin, bandana or not). What have you learned, grasshopper?